~GREEN BAY – Running-back-by-committee wasn’t necessarily the Packers’ plan for 2017, but it worked out that way, and pretty well, too. 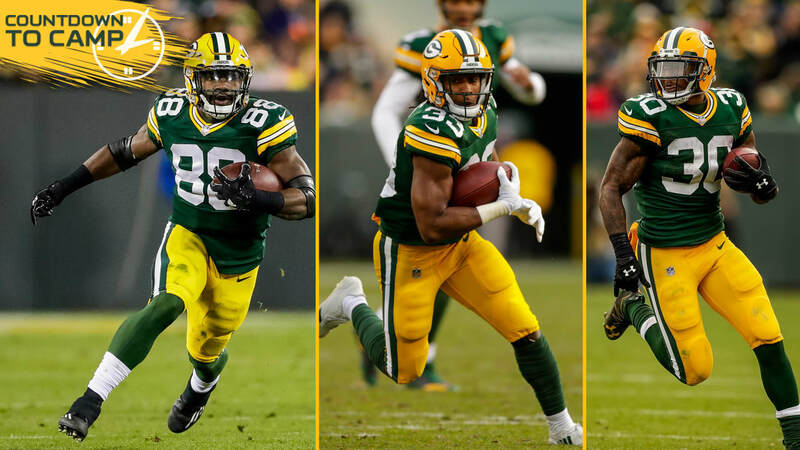 Amidst injuries and shifting roles, the trio of Ty Montgomery, Aaron Jones and Jamaal Williams combined for 1,277 rushing yards and 11 touchdowns last season. They added 457 receiving yards and three more scores through the air. The Packers would certainly take that level of production from their backfield again, if not more, and the top three backs are capable of delivering. The question is who will lead the way, now that Montgomery is back from a wrist injury that landed him on injured reserve late last year, while Jones and Williams are no longer rookies but experienced pros. Head Coach Mike McCarthy has stated he expects to begin 2018 with the by-committee approach and see where things go from there. The Packers actually will start the season without Jones, who’s suspended for the first two games. That makes the pecking order in the early weeks less significant, because it’s practically a given both Montgomery and Williams will play, provided they’re healthy. Last year, Jones was the big-play guy, with touchdown runs of 46 and 20 yards and a 5.5-yard average; Williams was the grinder, leading the group with 153 carries for 556 yards; and Montgomery was the veteran showing them the way, particularly with pass-protection duties.